UV eye protection is important beginning at an early age, but it's never too late to start. 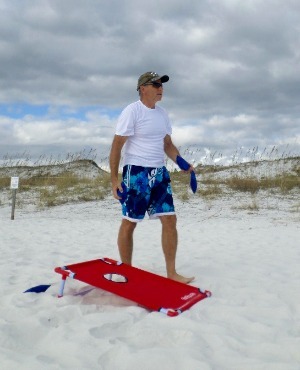 Incorporate a 3 fold strategy of staying under beach sun shade, putting on hats with sun protection, and wearing your polarized sunglasses with uv protection in and out of the water. Preventing cataracts by wearing sunglasses is one strategy to protect your vision. "Both UVA and UVB have damaging properties that can promote cataracts." states University of Maryland Medical Center. A strong family history has us aware of ways to reduce our risk of age related macular degeneration which interferes with central vision. "The Beaver Dam Eye Study reported that leisure time outdoors in young adult life was associated with the incidence of early, but not late, AMD." Did you know that the eyelids are one of the most common spots for skin cancer to develop? "The eyelid region is one of the most common sites for nonmelanoma skin cancers. In fact, skin cancers of the eyelid, including basal cell carcinoma (BCC), squamous cell carcinoma (SCC), and melanoma, account for five to 10 percent of all skin cancers. " All day exposure to sun and wind will dry out your skin but especially the area around your eyes. It's not easy to put sunscreen here as it usually results in watery and stinging eyes. Fine lines around the eyes are one of the first signs of aging. You can try to slow it down by wearing sunglasses that cover as much of your eye area as possible. 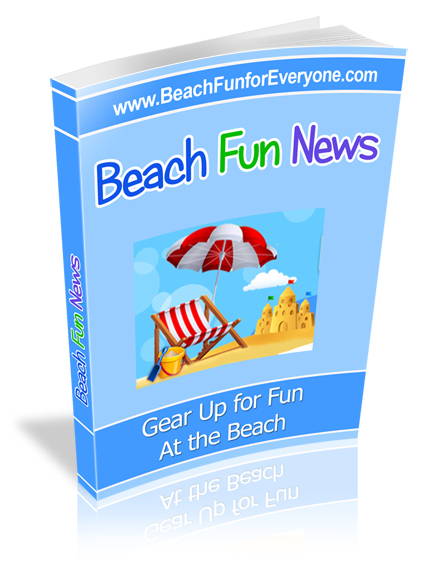 If you are not in the water combine sunglasses, beach shade and a hat or visor for maximum eye protection. Besides reducing glare and reflection, UV protective sunglasses provide many health benefits to your vision and to the skin around your eyes. You will appreciate these polarized sunglasses with 100 uv protection by Eagle Eyes that wrap around your face making them comfortable and stylish. 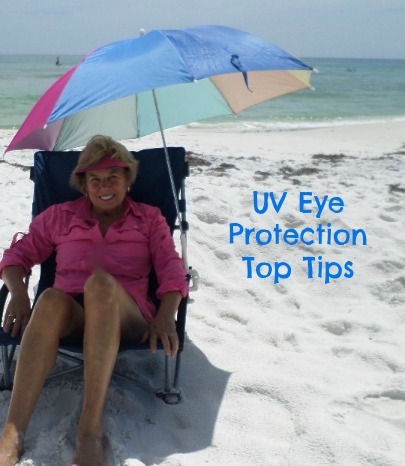 UV eye protection is not just for sunny days. The American Academy of Ophthalmology recommends 100 uv protection sunglasses on cloudy days as well. The sun's rays can pass through clouds and haze. Remember UV rays are strongest between 10:00 AM - 4:00 PM so take extra sun precautions during these hours. 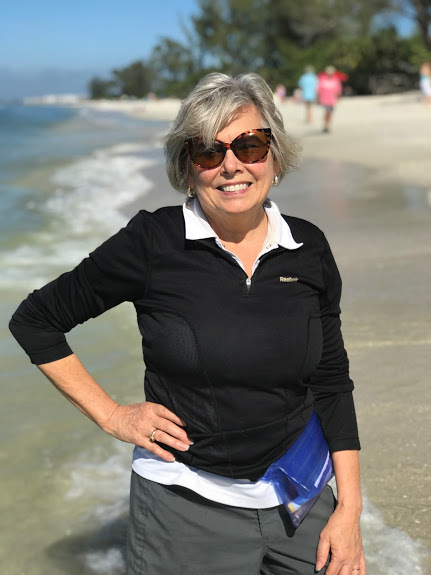 Bifocal sunglasses mean you only need to bring one pair of glasses to the beach so you can read your new fiction novel, read a text, scan a menu or check a price tag. You can choose from +1.5 to +3.5 magnification. 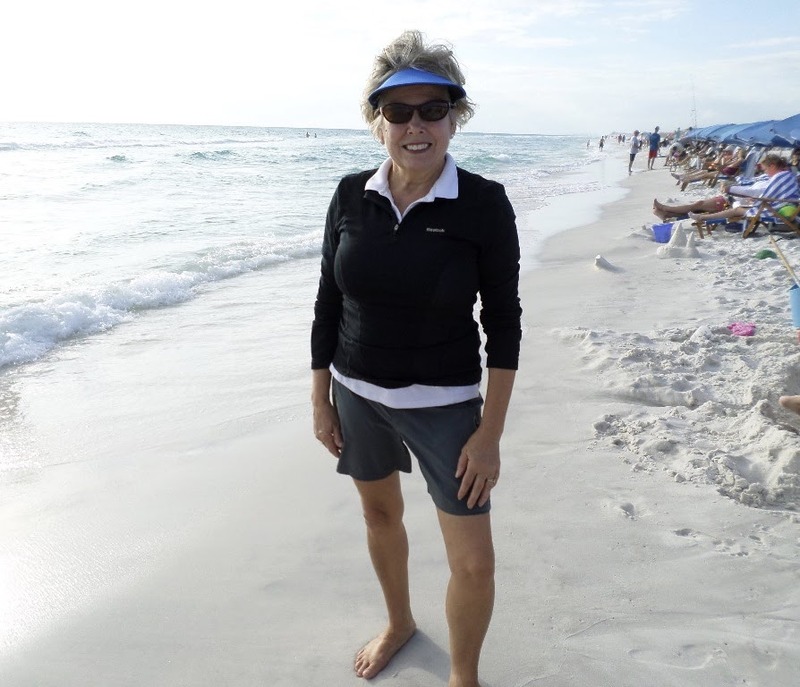 Polarized wrap around sunglasses protect your eyes from all angles and reduce glare coming from the sun, water and sand. Choose between a grey or brown lens and 7 frame colors. UV eye protection begins early to prevent the development of cataracts and macular degeneration. Have your children help select their own pair of "cool" sunglasses to insure that they will wear them. 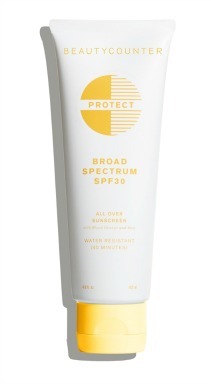 Just be sure that the tag says 100% UVA and UVB protection. 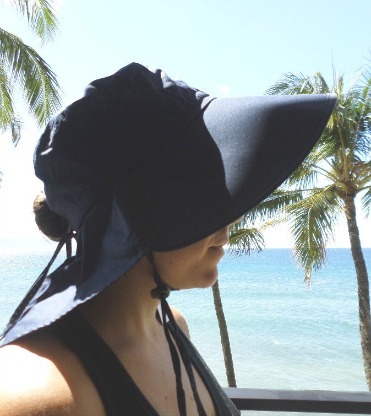 Wide brimmed hats with sun protection like this one pictured helps to protect your face, forehead and the skin around your eyes. Made of cotton fabric for coolness, and an opening in the back to accommodate a pony tail or bun, makes it a favorite hat for the beach. An adjustable strap around the chin prevents the wind from blowing it away. I prefer visors to hats and if I'm outside I've got on one of my many no-headache visors. They come in a variety of colors and designs to match your beachwear. The no-headache visor comes in two different sizes with the largest brim at 4" providing the best face sun protection. 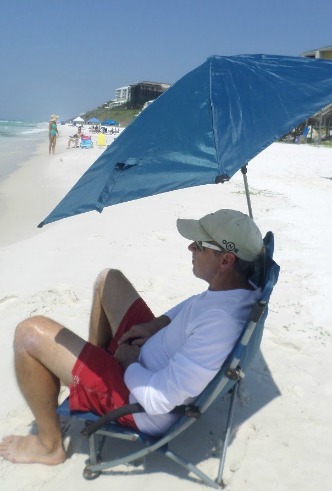 A clamp on beach umbrella is a great way to provide shade to your face - anytime of the day. An adjustable and telescoping pole allows the umbrella to be readjusted as the sun moves. 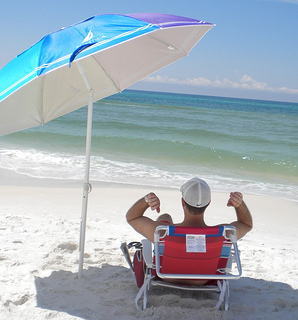 However a beach umbrella and visor do not provide enough UV protection. 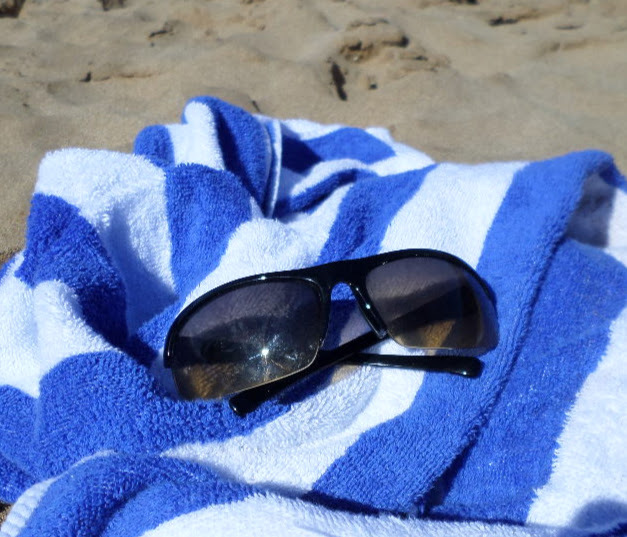 When at the beach UV rays can bounce off the sand and water making it all the more important to wear sunglasses. 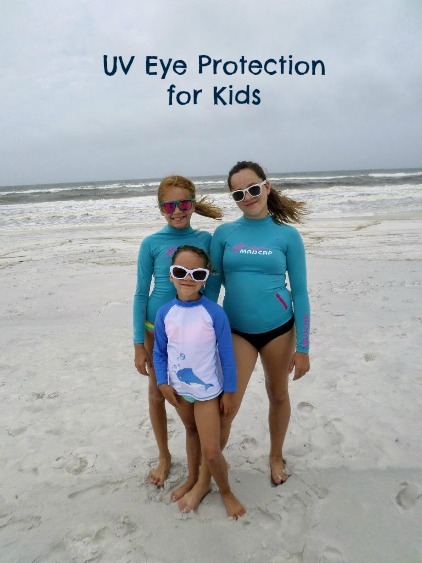 You can implement UV eye protection even in the water. 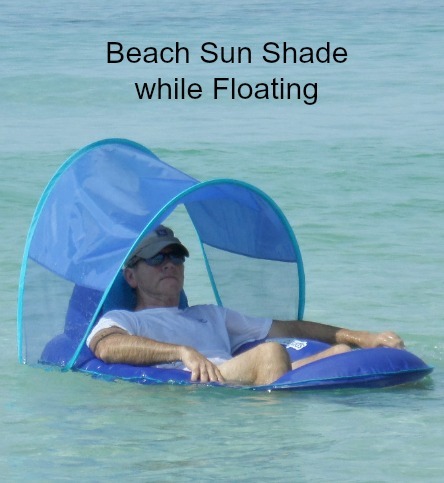 Find a float with a canopy, keep your hat or visor on, and wear sunglasses with a floating sunglasses strap. 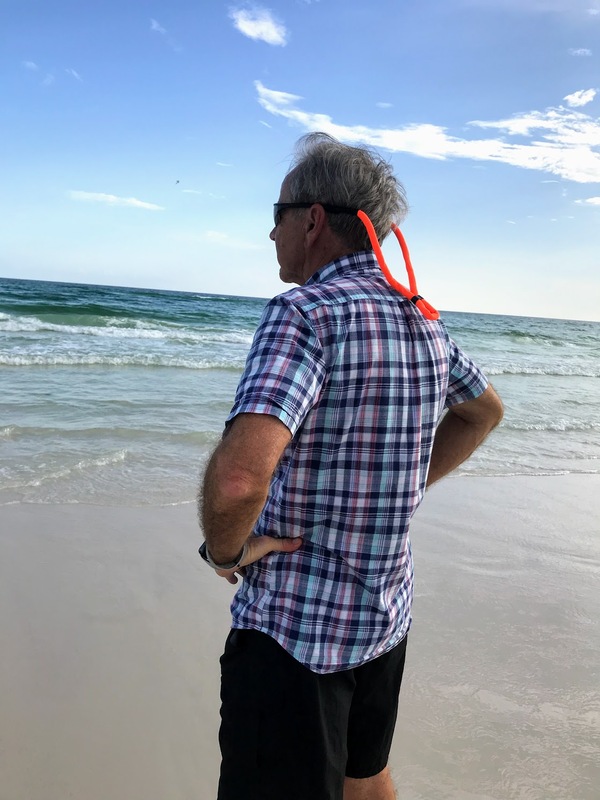 After our granddaughter found 20 pair of sunglasses in the ocean with her mask and snorkel, we realized many people are unaware of floating sunglasses straps. 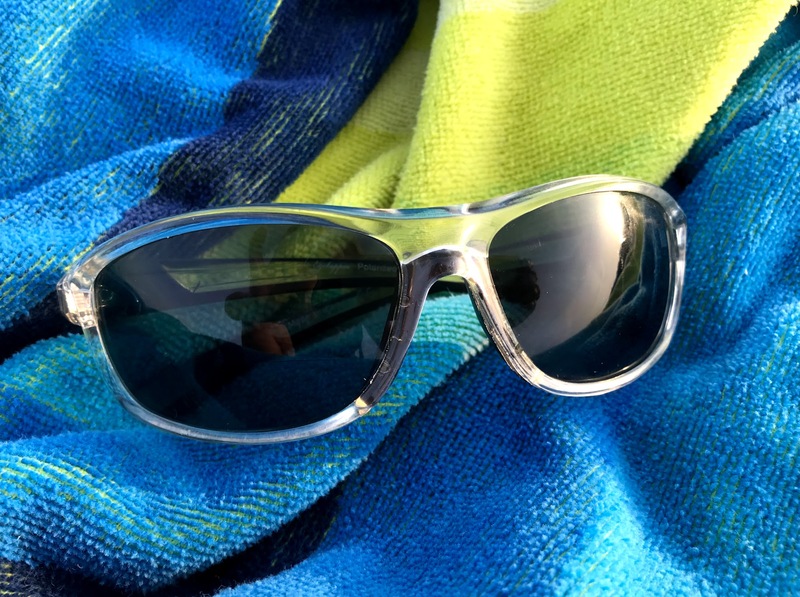 An inexpensive way to protect your investment in a good pair of sunglasses is to wear a floating sunglasses strap whenever you are in the water. 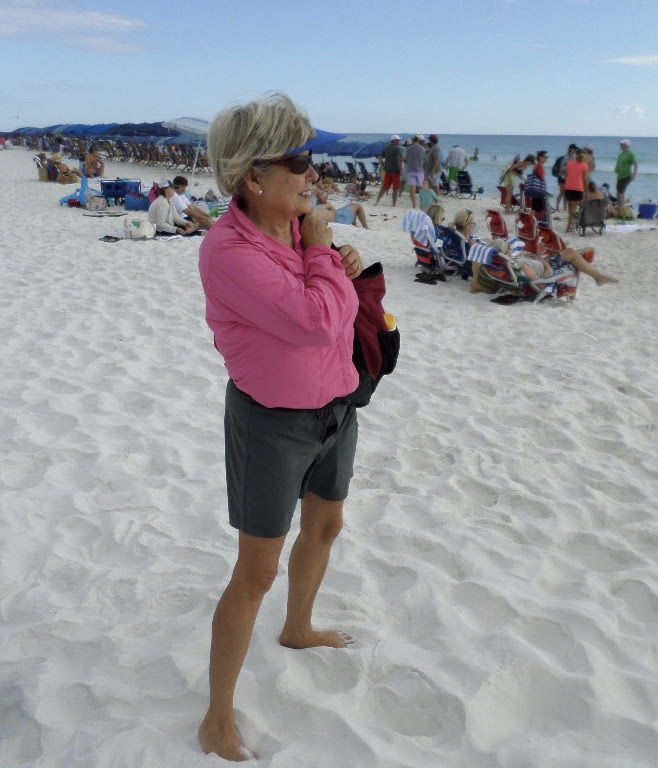 Enjoy your time at the beach while staying protected from UVA and UVB rays that can contribute to skin cancers, cataracts and macular degeneration.